‘Hello Mr Rees, You probably won’t remember me, (you must see an awful lot of knees! ), this is just a short note to express my heartfelt thanks to you and your team who completed both my total knee replacements recently (my right one beginning of June last year and my left one in March this year). To say it is life changing is an understatement! Both ops were very successful and even [the Physiotherapist] was impressed! You explained to me when we first met that the operation you would do would only be a part of the cure, the rest was up to me. I took you at your word, and I have lost two and a half stone, and I attend a local gym three times a week working on cardiac fitness and building up the leg muscles. I’m even starting to enjoy it. The results of our joint (excuse the pun) efforts is that I can now walk completely without pain, and I have recently walked over 7 miles on a regular basis, I can go up and down stairs, and I am working on being able to cycle again! I feel a new man! 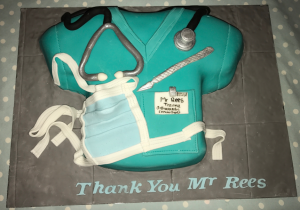 ‘Dear Mr Rees, It is now almost a year since you and your team carried out an ACL reconstruction on my knee and I just wanted to let you know what a difference it has made to my quality of life. I wasn’t the average age for this operation (53) but the rehab has gone well and I feel great! It makes such a difference being able to run down a slope, or jump off a step, go to a barn dance or have a game of ping-pong without worrying about my knee giving way. The scar is really neat and is hardly noticeable and I am continuing to work on building up my muscles, using the exercises and the advice given to me by the lovely physio team. ‘Today I believe is the signing off on my (right knee) operation. So, I just wanted to again express my thanks through you to the team you lead in the theatre, to the ward staff, liaison nurses and physiotherapists who follow the process to its very successful conclusion. The left knee is also in problems….if it is done, I would dearly like the same main players – surgeon and anaesthetist!…. The main course – the knee! I think it’s brilliant! I’ve been hanging around with a silly smile on my face for a week. I think techniques must have changed in the past 6 years from my experience – so far! ‘I cannot thank you enough for what you have done for me. I know I was a very high risk to have surgery and yet you took me on. You have given me a new chance in life to walk again without all the awful pain that I suffered for years on my knee. To feel the freedom in my leg is something I never, ever thought would happen. Foy years I have had to have some sort of support on my knee from ankle to thigh. It’s heaven to be free from that! I thank you for all the hard work you did in getting my leg straight, something I thought I would never see. I have to keep looking at it to see it really happened! Thank you to all who worked with you as a team, a wonderful team that helped to give me my new knee. Many, many thanks to your special anaesthetist, who did a great job to relax me and made me feel safe. Thank you to all the nurses who helped look after me, especially the Liaison Nurses who were there if I had any worries. Many years ago, I had my first joint surgery, when I was 11 years old at Black Notley Hospital. My surgeon was Mr Moore, then a few years later, more surgery by Mr Waddington. So it was quite something for me to go to the ‘Waddington-Moore’ Seminar room prior to my surgery. Now I have another special surgeon on my list of many, you Mr Rees. ‘This is a very much overdue letter from my point of view. I have gone to write it many times, but I thought it may be wrong for your personal privacy. But here I am, Mr Rees, I just had to thank you personally for the great job you did on my knee. And I really do thank you. It has been great these past few weeks, as you are well aware, it was very swollen and bruised on all parts of my leg. And of course very painful, but I stuck with it all the instructions and help offered and I am quite amazed at how well it has done. Nearly all the bruising has gone, the leg is still a bit hard, my ankle and foot are still a bit tight but the knee has progressed day by day. It is only slightly swollen, the scar is supreme and the movement is wonderful. I know it isn’t all over yet, but I just had to pass on my grateful thanks to you for a wonderful restoration of my knee (no pain). I would like to have thanked you personally, but of course that’s not possible, but I do sincerely thank you for my return of a good and reliable knee (no pain). I have to attend a physiotherapy appointment on Thursday with physiotherapist Sue Partridge and her team and I will be happy to pass on my thanks to them for all the help and guidance they gave me, full marks for all the nurses on the wards, my compliments to each and all. But, to finish my letter of thanks, I must say once again Mr Rees I am very grateful to you for my return to fitness and that I have my mobility once more. Thank you for a wonderful knee replacement and return to normal life.